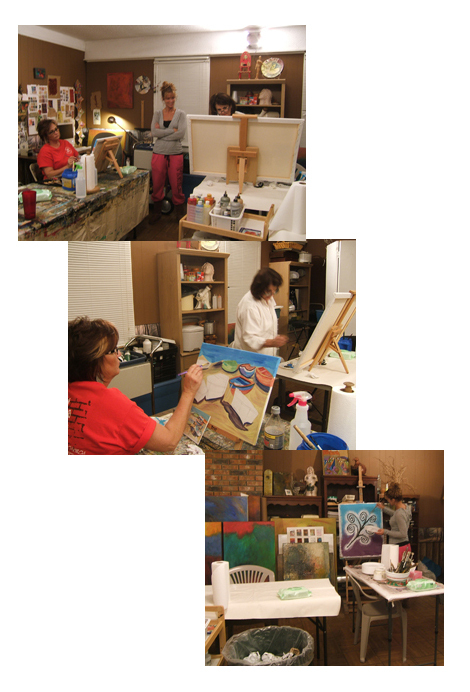 Weekly painting class in my studio was fantastic this Tuesday evening. The students were so excited about what they were doing! I’ve taken the individual approach, and am glad the class is small. There are tons of questions and I’m constantly moving from person to person. They are surprising themselves with their successes! I love when they go out the door laughing, talking, and excited. Two of them are working realistically and the other two are more experimental. I’m just there to help them accomplish what they want to do, and help with ideas if they’re stuck. One student had a very, very frustrating night the week before, but once she got over the hump with her drawing problem, she sailed right through the painting this time. And the best part of all is that I hear they are talking about it everywhere. I many never have to advertise! I would like to consider a second series of classes, a different one in which the parameters are more certain and the experience level is more advanced. That would be a lot of fun and stimulating for me. Yesterday my little buddy Ethan was here for the afternoon. He always, always asks if he can paint. So since I had the studio set up as a classroom, I said OK. The table we use in class for rolling with the brayers is a little lower than the rest and it was perfect for him. He even got a chance to try the brayers. He loved that. Janice, I wish we could do some workshops at a mutually-workable location. Might as well wish for big things, right? looks like you are going full speed there and having a really fun time. Ethan is experiencing what we adults always strive for….”childs play.” The utter joy of being spontaneous…. Oh, so very true, Karin Lynn! It’s an intense experience when you’re in it, but I always hope some of that energy rubs off on me. He’s four, and is so careful not to smear paint on himself. 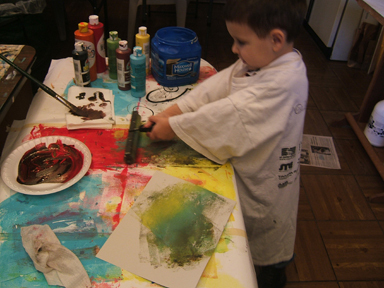 Those big sleeves on my T-Shirt that he’s wearing kept dragging over the paint, which caused him a little stress. Looks like painting makes people feel like kids again. What a wonderful therapy. I believe it does, Eva. It is indeed good therapy — as I can attest! I’d come if I was nearer. Such fun! I wonder what you will do next. I wish you were nearer too, Myfanwy! I know this reply is late, as I’ve neglected my blog for the past week, but there’s been another class and they are continually amazing me.